Marshmallow Man to Ironman: Canadian Ice Cleats for Running! Canadian Ice Cleats for Running! I had some trouble last week running on ice. In all my winter running it's never been quite this bad for quite so long... a little ice here and there, but we had a really bad dump of rain followed by a flash freeze. Sidewalks have been like skating rinks! 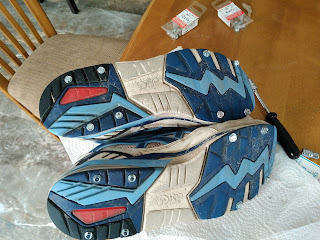 So I watched a video on the YouTube on how to convert regular old running shoes into ice gripping awesomeness. I didn't put quite as many in as the guy in the video, but my soles were pretty thin at the front... I was worried any in the middle would poke through. I used the 3/8" ones in the front, 1/2" in the back. 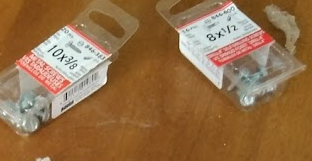 I could have just used 3/8" everywhere - they worked just fine. And they actually have a larger head to them. My run was in about 2 inches of snow, less in some places, more in others. The ice underneath proved no challenge, had grip. I'm not sure how great they would be if the snow wasn't there - you could definitely tell there were screws under the shoes when there wasn't snow, might have been uncomfortable. But I'll have to try it on a snow-less icy day sometime to find out for sure. But not back for $6 and some old shoes I wasn't using anyway!